Ski resort stamped “Mont-Blanc Natural Resort”, Chamonix-Mont-Blanc is a mythical destination! You are at the heart of the legend. Look up! You are at the foot of the highest peak in Europe, the Mont Blanc. You do not have to be a ski champion to enjoy this legendary ski resort, between family skiing and extreme skiing, in Chamonix, you will enjoy plenty of urban or more festive activities in a lively town centre day and night. When you buy a ski property in Chamonix it gives you access to 1 snow park, 85 pistes, 119kms of pistes and of course direct access to one of the highest ski area in the world with guaranteed snow. 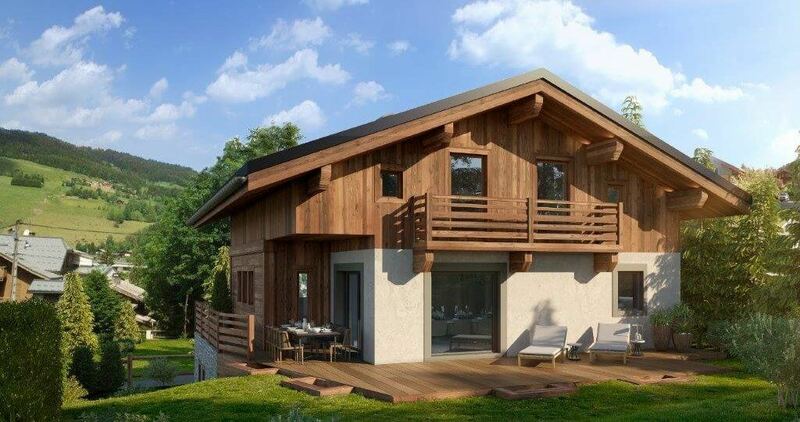 When you decide to buy a ski property in Chamonix, ski beginners or experts, the quality of equipment and natural sites is second to none to give you multiple sensations next to Mont Blanc. If winter sports are the flagship activity of the Chamonix-Mont-Blanc Valley, a cultural mix exists in the Chamonix Valley. The proximity of Switzerland and Italy is certainly not unrelated to this phenomenon. In season, the many nationalities present in the resort of Chamonix give the Mont-Blanc valley an amazing cosmopolitan aspect and a rare wealth. The Domaine des Grands Montets is the area through which Chamonix’s reputation has no doubt been built. In fact, there are the most important elevations of the valley, ski slopes with very steep slopes and fabulous off-piste routes. If you are beginners, go your way, the Grands Montets it deserves and it respects! More than a dream, riding from the summit of Les Grands Montets (3275 m) is a near-culmination for fans of skiing. The magical setting combined with the 2000 meters of vertical drop available to your spatulas up to Argentière contribute to make Grands Montets a privileged spot for all self-respecting skiers. – For freestyle enthusiasts, a snowpark and a boardercross await you on the Lognan domain. – A remarkable snow cover until May. Of the 4 ski areas offered by Chamonix, the Balme sector is undoubtedly the most accessible and the most suitable for beginner or intermediate skiers. – Possibility to eat at the Chalet de Charamillon. Connected by a cable car, the Brévent and Flégère ski areas are one of the most beautiful sites in the Alps. Facing south, they invite you to come enjoy various tracks facing the Mont-Blanc range. The Brévent sector is the southern slope of the Chamonix Valley ski area. From Chamonix, it is accessible via the gondola that takes you to Plan Praz (1999 m), then via the Brévent cable car that takes you up to 2525 m.
Once at the top of the Brévent cable car, you find yourself facing the majestic Mont-Blanc (take the time to contemplate one of the most beautiful views of the Alps). As for skiing, the Brévent sector is for skiers of all levels (even if beginners will have to settle for a single green slope). The southern exposure of the tracks implies a strong sunshine very appreciable on cold days. From the village of Praz, the Flegere cable car gives you access to the area of ​​the same name. By following the index chairlift, you will quickly reach the summit of the estate at an altitude of 2595 meters. South-facing, the Flégère ski area offers varied ski slopes, suitable for all categories of skiers, and ideally drawn facing the Mont Blanc range. We particularly recommend the black run from La Flégère to Praz (800 meters of vertical drop through the spruce forest), but the Flégère also offers excellent off-piste spots (the Lachenal combe, the head Aubuy ..). Landmarks – Ski resort Brévent / La Flégère – Altitude of the ski area: 1030m -2525m – Brévent and Flégère sectors are connected via a series of blue slopes and a cable car connection – 32 tracks (7 black, 7 red, 13 blue and 4 green) – Possibility to eat at Plan Praz (La Bergerie restaurant) at Brévent (Le Panoramique restaurant), at the top of the Flégère cable car (at the Adret restaurant or the Trend Foehn snack bar) and than on the ski slopes at La Chavanne snack bar. ► Nordic skiing area of ​​Chamonix Cross-country skiing enthusiasts, you can practice cross-country skiing in the heart of the Chamonix Valley thanks to the different routes, whatever your level. The valley offers two magnificent sets of trails for cross-country skiing, in Argentière on the one hand and from the center of Chamonix to the hamlet of Les Bois on the other. The network of tracks is very well maintained, of all levels, with artificial snow of quality. Finally, lovers of cultural visits will find their happiness at the Espace Tairraz (A space both fun and educational allowing the visitor to get into the skin of a mountaineer), the Alpine Museum, the Museum of Crystals or even at the House of Memory and Heritage. In addition to the 13 altitude restaurants scattered throughout the ski area, Chamonix also has no less than 35 restaurants located in the heart of the resort. From the real gastronomic establishment to the more modest but no less convivial signs, the choice is vast. Traditional cuisine, mountain specialties, regional menu, brasérade, homemade soups, pancakes, pizza … it’s up to you! For a drink with friends or to party until the end of the night, go to the bar of the mill, the Choucas, Caves du Pele, or even the Mix bar … Ambiance assured! An ascent by cable cars to experience the atmosphere of the high mountains, safely! At the top, 4 terraces with 360 ° panoramic views of the French, Swiss and Italian summits and departure to the mythical Vallée Blanche! To do at least once in his life and … to rediscover each season. A high mountain glacier route, in an impressive environment, from the mythical Aiguille du Midi (3842 m) to arrive, depending on the snow conditions, in Chamonix station (1035 m) or on the Montenvers site – Sea of ​​Ice (1913 m). 20 km of unforgettable descent, unsecured and unmarked. To discover imperatively with a mountain guide. The spot of great skiing and freeride. Slopes, powder and unevenness on the north face. Attention, the summit of Grands Montets is accessible only to holders of a Mont-Blanc Unlimited package! Another cog train ride from St-Gervais / le Fayet, another access to the Houches-St Gervais ski area.